The Porsche 356 was the company’s first production automobile. Production started in 1948 when approximately 50 cars were built. In 1950 the general production of the 356 continued until April 1965. It is estimated approximately half of the total production of 76,000 Porsche 356s still exist. 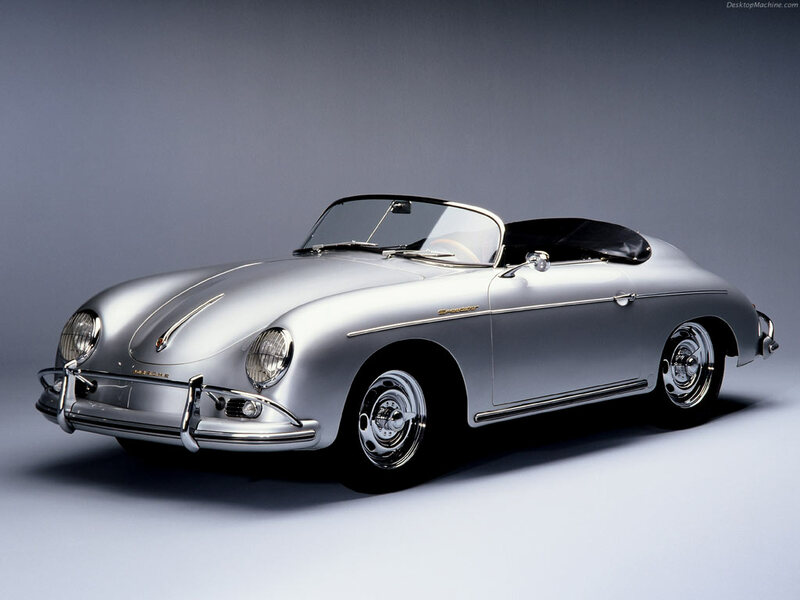 The 356 was created by Ferdinand “Ferry” Porsche. The 356 was a four-cylinder, air-cooled, rear-engine, rear-wheel-drive car utilizing unitized pan and body construction. While the 356’s body was an original design by Porsche employee Erwin Komenda, its mechanicals were derived from the Volkswagen. Porsche quickly re-engineered and refined the car with a focus on performance. By the late ’50s many fewer parts were shared in common between Volkswagen and Porsche. The early 356 automobile bodies produced at Gmünd, Austria were handcrafted in aluminum, but when production moved to Zuffenhausen, Germany in 1950, models produced there were steel-bodied. The basic design of the 356 remained the same throughout its lifespan, with evolutionary, functional improvements rather than yearly minor styling changes. A variety of models in both coupe and convertible forms were produced from 1948 through 1965. Cabriolets were offered from inception, and in the early 1950s over 50% of total production. One of the most desirable collector models is the Porsche 356 “Speedster”, introduced in late 1954 after Max Hoffman, the sole US importer of Porsches, advised the company that a lower-cost, open-top version could sell well in the American market. With its low, raked windshield, bucket seats and folding top, the Porsche Speedster was an instant hit. Production of the Speedster topped 1,171 cars in 1957 and then started to decline. It was replaced in late 1958 by the “Convertible D” model. It featured a taller, more practical windshield, glass side windows and more comfortable seats. The following year the 356B “Roadster” convertible replaced the D model. Soft-top 356 model sales declined in the early 60s. To distinguish among the major revisions of the model, 356’s are generally classified into a few major groups. 356 coupes and “cabriolets” built through 1954 are readily identifiable by their split windshields. In 1955, with several small but significant changes, the 356A was introduced. Its internal factory designation, the Type 1, gave it the nickname “T1” among enthusiasts. In early 1957 a second revision of the 356A was produced, known as Type 2. In late 1959 more additional styling and technical refinements gave rise to the 356B. This was known as the “T5” body. The mid 1962 356B model was changed to the T6 body type. The twin deck lid grilles, an external fuel filler in the right front fender and larger windows are indicators. The last revision of the 356 was the 356C which was introduced for the 1964 model year. It featured disc brakes as well as an option for the most powerful pushrod engine Porsche had ever produced, the 95 hp SC. Porsche 356 production peaked at 14,151 cars in 1964. The company continued to sell the 356C in North America through 1965 as demand for the model remained quite strong in the early days of the 911. The last ten 356’s were assembled for the Dutch police force in March 1966 as 1965 models.